When my husband and I found out we were going to have a baby, we were so excited. Little did we know of the journey baby Madison would take us on, and little did we know of the personal tragedy that would ensue following such a typically joyful time. Madison was a patient at St. Mary’s Hospital and Mayo Clinic intermittently during her life. We were so impressed by all the caring staff we encountered there. They all took such great care of our daughter and treated her like their own child. We could not have asked for better care. My story is about my journey with my daughter Madison, who was a patient at Mayo Clinic/St. Mary's Hospital from late December 2009 through mid-May 2010. Madison was born on Christmas Day 2009 without complication in a small hospital in southwestern Minnesota. We were discharged home two days later. That night Madison began having trouble breathing and turned blue. We rushed her to the nearest emergency room and from there was helicoptered to Avera in Sioux Falls, South Dakota. Madison was experiencing seizures and needed to be intubated because she stopped breathing. Her body was beginning to shut down, and no one had the answer why. Madison's doctors at Avera believed she needed to be seen by a neurologist, which was not available there. That day she was ambulanced across town to Sanford Hospital to be seen by neurology. This was the fourth hospital Madison had been in since her birth only three days before. After some more testing, it was revealed that Madison had a critically high ammonia level and was thought to have some type of metabolic condition. Sanford doctors consulted with Mayo doctors at St. Mary's Hospital, and she was flown there that night. 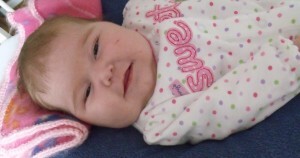 Madison was in the NICU at St. Mary's until the beginning of March. During that time, it was a struggle to attempt to find a treatment for a relatively unknown condition. She had tried many medications and formulas. After being discharged home, Madison was seen multiple times again in the hospital and Mayo Clinic including two more helicopter rides. Madison endured dialysis and multiple surgeries. Each time Madison's ammonia level got out of control, her brain took another hit. The only known cure for her condition, CPS (carbamyl phosphate synthetase), is a liver transplant. Due to her unstable ammonia levels, she was not eligible to be on the waiting list for transplant. Our ultimate goal was to get her on the list and to get her a new liver, although that was not meant to be. We met with her doctors in late April to discuss our plans for Madison. Again, we were told that Madison was not eligible to be on the transplant list. We could tell that her condition had caused some serious harm to her brain, as she was not the same little girl anymore. She seemed generally uncomfortable, and we could not bear to continue putting her through any more treatments only to prolong the inevitable. No one can live with this condition. At this time Madison was in the PICU at St. Mary's, and we had made our final decisions for Madison's care. We would have Madison baptized and would stop treatment the following day-Mother's Day. On Ascension Thursday, May 13, Madison took her final flight, as we said our final goodbyes. Since Madison's passing there have been some changes within the medical community. Mayo Clinic doctors have constructed a hyperammonemia protocol for babies coming in with high ammonia levels. At least three additional hospitals have purchased the necessary equipment to be able to test ammonia levels within their hospital rather than sending them out to larger facilities. This saves valuable time for babies with high ammonia levels, and it also is valuable for other patients with liver-related ailments. St. Marys Hospital has plans to create a team that will be called in the event a baby comes in with suspected urea cycle defect disorder (which is the group CPS is classified). This team would be named after Madison, and my husband Eric and I have consented to be involved if the family wants additional support from parents who have gone through a similar situation. All who cared for Madison have learned tremendous amounts of knowledge. Because Madison has taught us so much, I felt the need to share this information with the hope of helping others. This is the reason for the creation of my book, A Balloon in the Snowstorm: Madison's Journey, which was released June 2012.